Our first winter storm of the season is in the books, but its remnants resulted in another day of closures and delays for some area schools. Drivers will encounter a lot of wet pavement Friday morning after Thursday's snow left some roads a slushy mess. Storm Team4 says some areas fell below freezing overnight, so any pavement that looks wet could be frozen solid. In the District, Chain Bridge Road near Canal Road was shut down for a short time Friday morning due to icy conditions, but it has since reopened. Arlington, Culpeper, Fairfax, Falls Church, Loudoun and Prince William counties and Alexandria, Manassas City and Manassas Park public schools will open two hours late on Friday due to icy roads. Fauquier County public schools are closed. Our first winter storm of the season is in the books, but its remnants resulted in another day of closures and delays for some area schools. Storm Team4 says some areas fell below freezing overnight, so any pavement that looks wet could be frozen solid. Several crashes were reported in the region Friday morning, including a chain-reaction crash involving multiple cars on an icy bridge in Sterling, Virginia. The first snow of the season was a record-setter at all three airports. 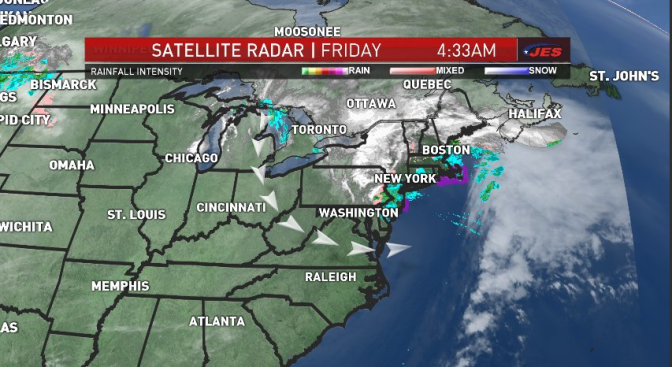 Reagan National Airport and Baltimore-Washington International Airport saw over an inch of snow Thursday, while Dulles got three inches. How Much Snow Did the DC Area Get? The weather will be cool and breezy Friday, but the sun will make an appearance. It's set to be a dry day, with a high of 48 degrees. Expect highs around 50 for the weekend.